As Christmas nears I find myself out in the freezing cold more shopping for all the festivities to come. It's been crazy cold here in California and the only way to go out is all bundled up. I love to keep my neck warm so a scarf is my go to accessory plus it adds texture and color to any outfit. 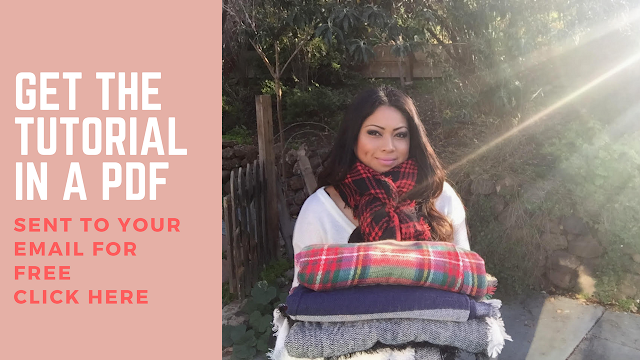 Check out this youtube video it's a simple tutorial that will help you re-create my favorite ways to wear a blanket scarf. I hope you find this video easy to learn from. Comment below what's your go to style on wearing blanket scarves! I'm having a little giveaway for those of you who subscribe to my channel and leave a comment! You can enter here to win a Blanket Scarf and Kylie Cosmetic Lip Gloss ! I love blanket scarves, thanks for the tutorial! Thank you ! I'm so glad it was helpful. Nice. I used to be the same way. Makes me happy that you found it helpful. 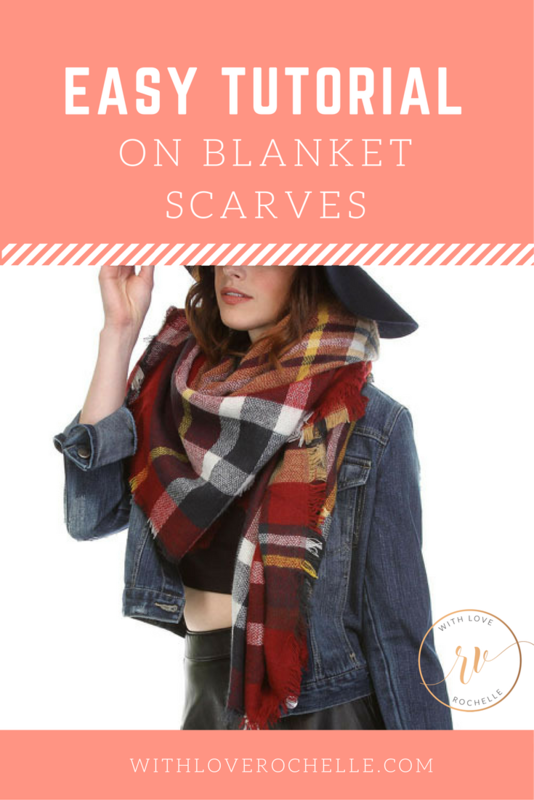 I had no idea there were so many ways to wear the blanket scarf! Thank you so much for the tutorial. I'm pinning it for future use! It's sooo cold here in Indiana right now... I love wearing comfy, warm scarves like this when it's bone-chilling cold like this!!! I couldn't even imagine. When its in the 40's in California I'm dying, lol. BTW, Check your email you won the giveaway! Thanks for the love. Happy New Year! I enjoyed the video,i needed the instructions!!!! Awesome. Hopefully it was easy to follow. What wonderful cozy scarves! Thank you for sharing these ideas. You're so welcome. I'll have a few more videos coming soon. My fav go to accessory for sure. I love these! Perfect for this cold weather! Sweet! Aren't they the coziest chic accessory when it's freezing? I needed this tutorial! In the past I've worn infinity scarves, but I'm loving the blanket scarves, but wasn't quite sure how to style them without looking awkward. Thank you! I was the same. I thought these things are so huge and awkward size that I had no clue either. Now they're like my best friends. I love a good blanket scarf! And I love seeing how different people wrap them! They're so many more ways but I thought let's stick to the basics. I think I may show a few more ways coming up. Happy New Year! I love scarves! I own a bunch and I will probably buy more! I recently crocheted a neck warmer and I plan on crocheting a shawl next. That's awesome ! I'm sure the shawl will come out perfect ! I was given a beautiful blanket scarf and love it. My challenge was how to wear the darn thing. So glad I found your post. Yay! Get it girl! You got this. Just watch the video as your trying to wear it the next time. You'll get it !!! This is a great tutorial, I'm always looking for new ways to wrap my blanket scarves. I'll most likely do an update video at the end of the month with a few more ways to wear the blanket scarves. I love blanket scarves but I only know one way to do them. Love this tutorial. Hopefully you know about 3-4 more after the video. If not keep watching ;) Thanks for the love. I totally needed this. I could not figure how to wear one. Ha. Sweet, so glad it was helpful. Looks great! Warm and stylish. One of the best ways to prevent catching colds in winter is to wear a scarf! Exactly. Sometimes I use them as blankets too! Thanks for the tutorial! I am in love with comfy blanket scarves and need new ways to wear them! Awesome. Makes my day when I hear that it was helpful. Love blanket scarves! Thank you for sharing different ways to wear it! You are so welcome. Thanks for watching. Sweet. I'm glad I got you to try a few new ways. I usually change it up based on what I'm wearing too! Seriously this is such an amazing tutorial!!! I love blanket scarves. I have a few!! I adore blanket scarves! so cozy! Chic and cozy is the way to go! such a cute blanket scarf! Blanket scarves are so in right now too, so thanks for the info! You're so welcome. Thanks for watching. Awesome! I am terrible at scarfing - I like to think video helped. Glad to hear you loved the tutorial. I'm in love with oversized scarves too! Thanks for dropping some love. I'm hoping we get some more cold weather here so I can pull out the blanket scarf!